Good morning everyone, another bright and beautiful day here. I made my card and wrote my blog last night hence the references to it, but I needed more light to take my photograph, so I had to wait till today to finish everything off. With the title of my blog to do with bees as well as butterflies I have found it difficult to incorporate bees as part of my signature, but I was so excited tonight when another experiment led to me learning something new. 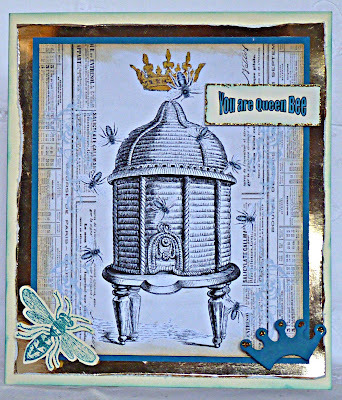 The Dutch Dare Challenge Blog has a challenge called 'Bee Happy' and immediately I was very attracted to it and the Creative Inspiration colour theme of turquoise, gold and cream. I love the Graphics Fairy blog which provides free vintage clip art to use in your art work and there is some amazing stuff to be had. I went across to look for a beehive as I have already downloaded some bees and yeh I found a fabulous one. I knew I wanted to create a hive with bees around it and I started experimenting, using Photoshop Elements, but I didn't know how to place objects on top of one another and anyway the beehive was a picture not a shape. After playing around for a while I had got bees around the hive but at a distance. In my desire to find out more I played with tabs and menus and found the magic extractor and this enabled me to 'cut out' the beehive, so I wasn't going to give up here and I carried on. I managed to cut out a bee and overlapped several of them on the hive. 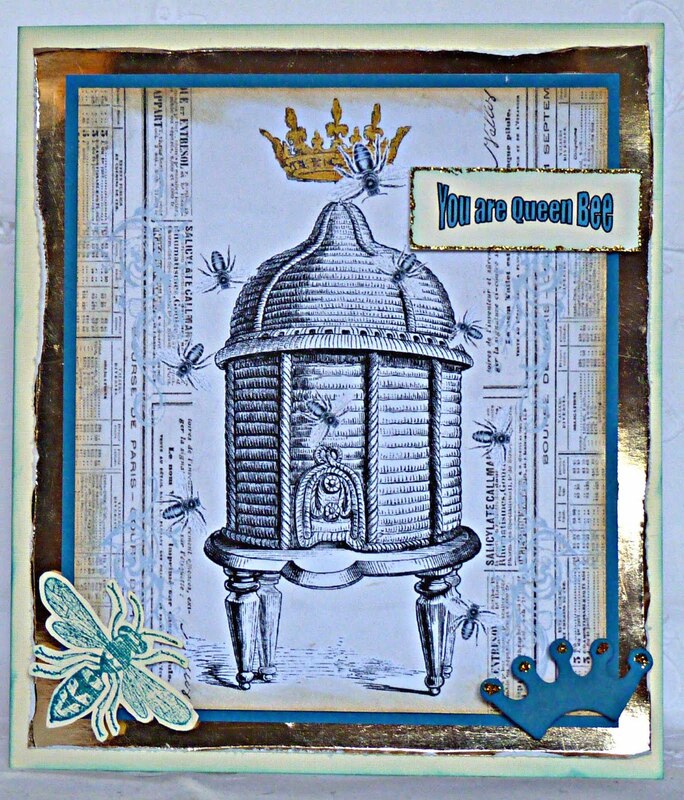 I had also found a gold crown which I wanted to incorporate and thought I could change my sentiment to 'You are Queen bee'. But I didn't have a paper that I could use with it and decided to use one from the computer. Originally I was going to print the paper off and then put it back in the printer to print the beehive over it, but that was going to cause problems in lining it up where I needed it. After more perseverance I was able to add the paper to my creation, take it to the back and line it up, then print the whole thing out together. So tonight I have learned how to make my own digital collage, and I am so pleased with what I have created. Hi Brenda, that is so clever wish I knew how to do this with the computer. Wow Brenda, This is a stunner, your creative mind and technical abilities really show in this creation. You must be very proud of the result. It's so very pretty Brenda! Thanks for playing along with us at DDCC!! Such a grat card! I love the stamps! Oh wow Brenda - its fabulous. I love that beehive image . Oh Brenda this I love so much what a stunning design I adore that image and colours oh wow this is wonderful. bees wasps who would think we would be putting them on our blog, but this is fabulous, you are so clever I wouldnt know where to start. I am looking forward to my day tomorrow, but I would swap with you as swanage is one of my all time favorite places in the world, have had many a beautiful holiday there, so have a good time, the weather looks good. Very unique! I really like it. Thanks so much for playing with us at Daisy Doodles. How great that you stuck with it - the result is fabulous. Thanks for joining us at Daisy Doodles. Oh it is absolutely gorgeous Brenda! So love your wonderful images and your colour is fabulous! This is sooo different (Mainly because I haven't see this image before!) love, such fun, thank you for joining Quirky Craft's Summer Challenge this week! Hi Brenda, This is a beautiful card!! Wow - Your collage looks great! I need to learn this.